It seems that every few months we hear news of another rural community inaugurating a village water system. But long at last, this time its Crooked Tree’s turn to taste the flow of water from a brand new water system. 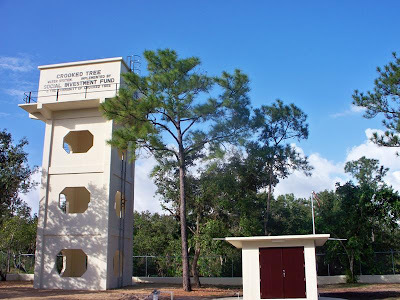 All the media are invited to attend the inauguration of the newly constructed Crooked Tree Water System on Saturday, December 19th 2009, at 10:00 a.m. The inauguration will take place in the Staine Area of Crooked Tree. Crooked Tree Village is situated 34 miles from Belize City, three miles off the Northern Highway. Over 900 residents will now have access to potable water. Crooked Tree is a village with about 245 families and is one of the oldest villages in the Belize District. 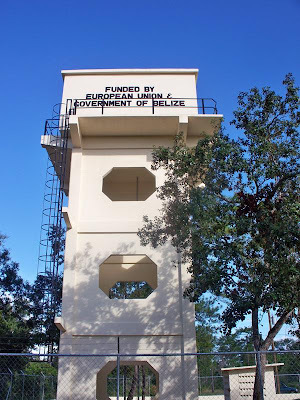 Thanks to the European Union and the Government of Belize, the use of hand-dug wells is now history. The Village had endured yearly water problems and in the dry season most of the wells would run dry. It is not unusual to see water trucks bringing water to the residents daily. The scope of works included the construction of 20,000 gallon ferro-concrete elevated tank reinforced for earthquake resistance, a pump house, a submersible pump with chlorinator unit, 77,000 feet of transmission and distribution lines, 7,950 feet of pipes for house service connections, and training in management of the system. The project was implemented by the Social Investment Fund (SIF), at a cost of approximately BZ$1,250,000, making it one of the largest projects of its kind. 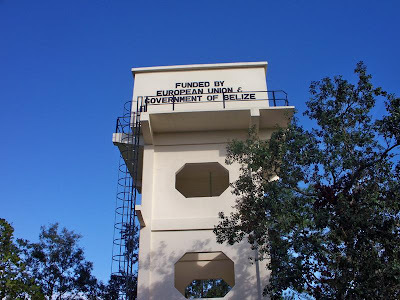 Of the total investment, 65% came from the Belize Rural Development Program (BRDP) as a grant from the European Union under the 9th European Development Fund, 22% from the Government of Belize as counterpart funding and 13% from the Crooked Tree Community for trenching for pipe installation. 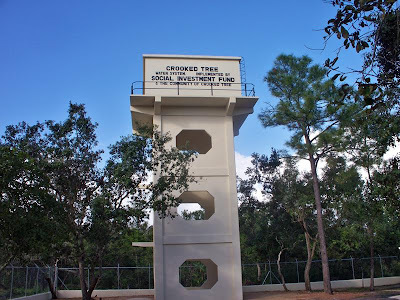 The new water system will improve the living and working conditions of villagers, provide a boost for the tourism sector as Crooked Tree host the annual Tilapia Fest, the Cashew Fest, and is home to the Crooked Tree Wildlife Sanctuary. Water holds the key to the development of commercial food production and processing of livestock, cashews, tilapia, among others which together can contribute to the reduction of poverty and the development of the region. For many years villagers of Crooked Tree were denied vital access to potable water. But getting connected to running water will not be the only new feature to Crooked Tree; villagers can expect their first water bill of BZ$10. in January 2010. Welcome address by Mr. George Guest, Chairman of Crooked Tree Village. Remarks by James Dawson, Chairman of Crooked Tree Water Board. Remarks by Daniel Cano, Acting Director of Social Investment Fund. Address by Dr. Marcelino Avila, Project Director of the Belize Rural Development Program. Minister of Economic Development, Commerce and Industry and Consumer Protection. Special Address by Hon. Gabriel Martinez, Minister of Rural Development. Guest Speaker, Mrs. Marion McNab, Chief Executive Officer in the Ministry of Labor, Local Government and Rural Development. Note of Thanks, Mr. Rudy Crawford, Past Chairman of Crooked Tree Village. Dr. Avila, Chairman George Guest and Chairman James Dawson. This is good news for our families in Crooked Tree. I was there this past summer when some of the trench were been dug out for the pipes. I was very happy to see men and women working together to get this project completed. Thanks Linda for keeping us up to date. The pictures are beautiful. Thanks Linda for the info - this is great for the people of Crooked Tree Village. Take care and Happy Holidays to you and your family. Linda, thanks for keeping us updated on what is going on in Crooked Tree Village. The pictures are beautiful!! And look at the blue skies in the background. The only thing missing in Crooked Tree is LOVE. All we need is love and respect for one another.